There are many legends of dragon like creatures in Africa. I have investigated the Ninki-Nanka of The Gambia, a crested, giant serpent associated with rainfall. It is much feared and blamed for death and accidents e ven to this day. The beast is supposedly able to strike a man dead just by looking at him. Bridges swept away by rainfall and road accidents have been blamed on the Ninki-Nanka. I even heard of a whole village that was abandoned after one such creature was seen. In lake Kariba we have Nyaminyami. This serpentine dragon god was known to natives of Rhodesia and Zambia since time in memorial. It was seen as a guardian spirit of the waters. During the construction of the Kariba dam that formed Lake Kariba, workmen were warned of he water god’s wrath. In 1958 the Nyaminyami was blamed the destruction of a large portion of the dam wall. A female supposedly ventured up the Zambezi River during a particularly bad dry season. Whilst upstream she was cut off by the construction of the dam. Workers reported seeing a large, dark object beneath the surface of the river just before the dam shuddered with a massive impact. Huge cracks ran up the walls of the dam and part of it collapsed sending workers to their deaths in the water. When the rainy season arrived a male was supposed to have smashed a hole in the dam freeing the female and a bro od of young. Some however, allegedly remained in the lake. One of he best know of these African dragons is he Inkanyamba of South Africa. This creature has a horse like head and a long serpentine body. Legends say that when looking for a mate an Inkanyamba will fly into he clouds. When angry they can create storms much like Asian dragons. The storms that ravaged Greytown, Ingwavuma and Pongola were blamed on Inkanyamba. The storms had tennis ball sized hailstones and 52 mile per hour winds. It made 2000 people homeless. There are even cave paintings of he horse headed serpent hat archeologists have dubbed ‘the rain animal’. It has horns on its head and a crest on its back. It is often depicted as spewing water from its mouth. Local Zulus and hair Sangomas (witch doctors) sacrifice goats and chickens to the water god. I is also said to eat the bodies of those who drown in the falls. Over thirty years ago he Inkanyamba was blamed for the death of a Zulu girl further up river at another falls. She was playing with her friends beside the river when she was pulled under and vanished. Of course this may have been a crocodile. Sightings of these creatures still occur from time to time. In 1962 a Conservation Services Ranger, Mr. Buthelezi saw one on a sand bank whilst walking along the Umgein River near the Midmar Dam. It slithered off the bank as he and a friend approached. Johannes Hlongwane was the caretaker of a caravan park near Howick Falls between 1969 and 1985. He saw the Inkanyamba twice, once in 1971 and again in 1981. It raised its head and neck thirty feet out of the water. It had a crest running along its back. In April 2000 reports began to circulate of a monstrous snake like beast in the community of Ezitapile in South Africa’s Eastern Cape. Captain Mpofana Skwatsha of the Aliwal North police reported hat livestock became agitated when the creature was at large. It was described as yellow, with a horse like head and a body as thick as a twenty quart barrel. 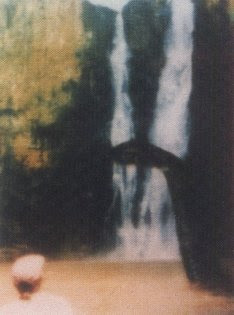 The only known photograph hat purports to show Inkanyamba was taken in the wake of a sighting local man Bob Teeny in September 1995. Whilst on a viewing platform beside the falls he claimed to have seen a snake like head and neck rear up out of the water. He had no camera at the time but put up a reward for anyone who could take a snapshot of the monster. 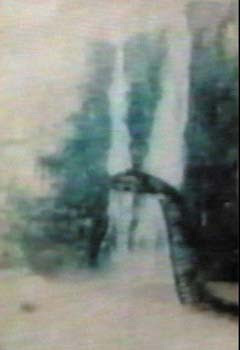 A resulting picture showed a long necked animal, apparently rising from the water. It appears to be holding waterweed in its mouth and has a distinctive banding of the skin. As soon as I saw the picture I knew it was a hoax. How? I recognized the ‘monster’ as an illustration of an Apatosaurus from a children’s book of dinosaurs published in the 1970s. I had the book myself; in fact the same picture had been used in two children’s books. Whilst recently rummaging around in a pile of old books in my grandparent’s house in came upon one of the books. He tome in question is called ‘Know Our World; Prehistoric Life’ published by Holywell House Press in 1977 and printed and bound in Italy by New Interlitho, Milan. 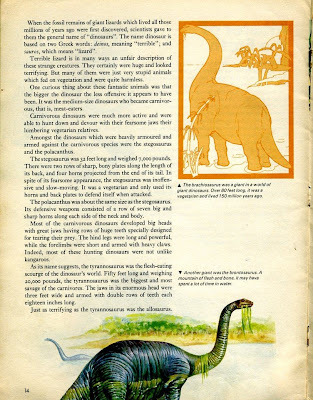 The picture in question appears at the bottom of page 14 and shows the dinosaur (then erroneously known as brontosaurus) wallowing in water and eating water weed (also erroneous as these creatures lived on land). Posted above are two versions of the Howick Fall photo. One darker, one lighter. And on the left is the illustration from the book. Though the picture has been reversed you can clearly see it is the same image. The head and neck have been superimposed on to the water. Look closely and you will see the waterweed in the ‘monster’s’ mouth and the banding on the neck (meant to be rings on muscle in the original illustration). Inkanyamba and its ilk my well exist but this is not a photograph of one. But this is a poor attempt to debunk a photo as a fake. I have seen others do this with other photos. It is not proof that this photo is a hoax just because it looks similar to a diagram on a book. I agree with shivakumar. The diagram in the book below doesn't even quite line up right. I have actually seen that photo plenty of times, and there is a negative film strip to prove that it is not a fake photo. There is actually a negative film strip to go along with this photo, the man who took the photo is not afraid to show the negative to people who don't believe its a real photo. Speak to Bob teeney, at the time the local wimpey burger owner.